EMS Copiers have been helping both large and small organisations save money on their printing costs for over 40 years. Our Managed Print Solutions team are highly experienced and can advise you on the best option to suit your work flow. We don’t believe in providing generic pricing. Our ethos is to visit your business and provide you with tailored pricing. The first step is a free, no obligation print audit, we look at the layout of devices, their volumes and any related factors and costs to determine an effective plan for your company, that will not just save you money but align with your work flow. Our Managed Print Solution can save you up to 40% on your overall print costs with rental being an attractive option for businesses. After a difficult few years and unstable economic climate many SME’s can now look forward and plan to expand and grow their business. For many this means they can now consider upgrading their infrastructure and hardware and invest in new printers and copiers. Up until now many business owners deemed it too early in the economic recovery process to outlay capital expenditure on printers and copiers. From a finance aspect rental has become a more attractive option as there is no capital outlay. From a budgeting and forward planning perspective rental allows for fixed monthly or quarterly payments over a number of years. For clarity and flexibility EMS Copiers provide a three tiered billing system, essentially only paying for the colour you use. 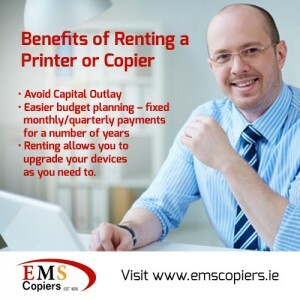 As part of the rental option EMS Copiers Managed Print Solution offers the customer maintenance, service and consumables in one invoice. This also makes tracking costs much easier for the Accounts department.